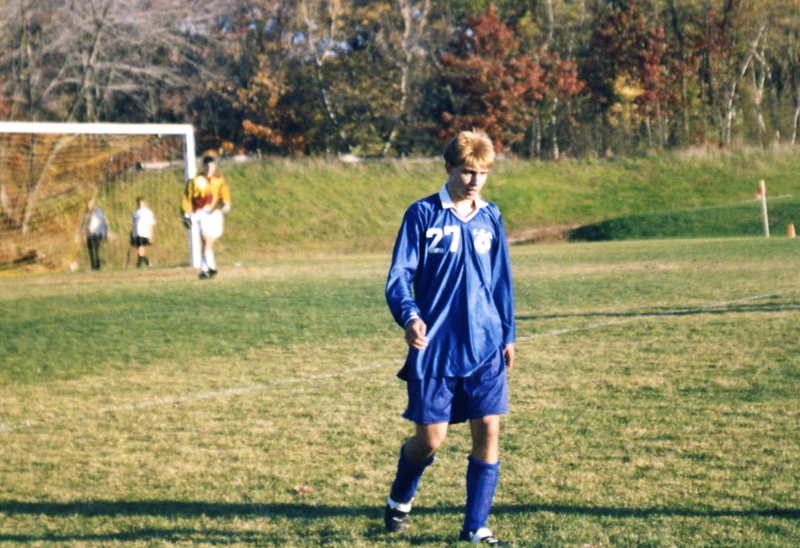 Andrew played soccer in high school. He still loves the game. Cole really has not been exposed to team sports, so he does not know the difference between soccer and football, baseball and basketball. 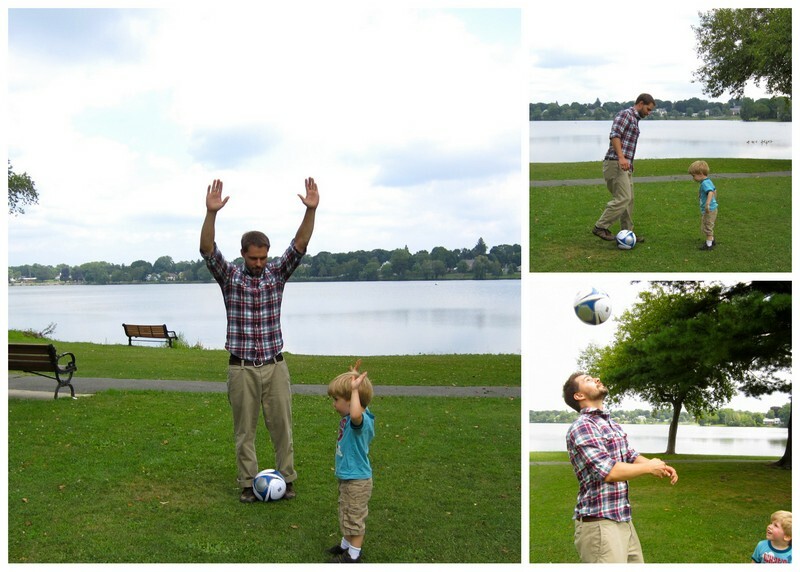 So today, we met up with Andrew on his lunch break and Andrew taught Cole a little bit about soccer . . . Such an important reminder for us to be intentional about setting aside time to just play together. I did it . 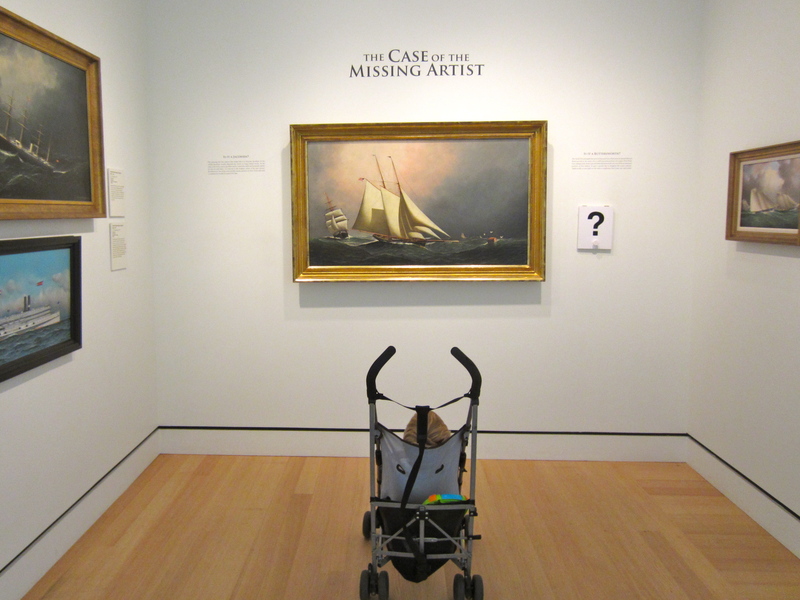 . . this week I took Cole to an Art Gallery by myself, something I have been thinking about doing since I saw the lady at the Isabella Stewart Gardner Museum. I worked at following my own tips that Andrew and I have used together, and the trip was lovely. I found it relaxing and inspiring. Cole had many fans as people commented on what a good little boy he was and how wonderful it was to see him appreciating art at such a young age. 2. We stopped in at a local arts and crafts fair. 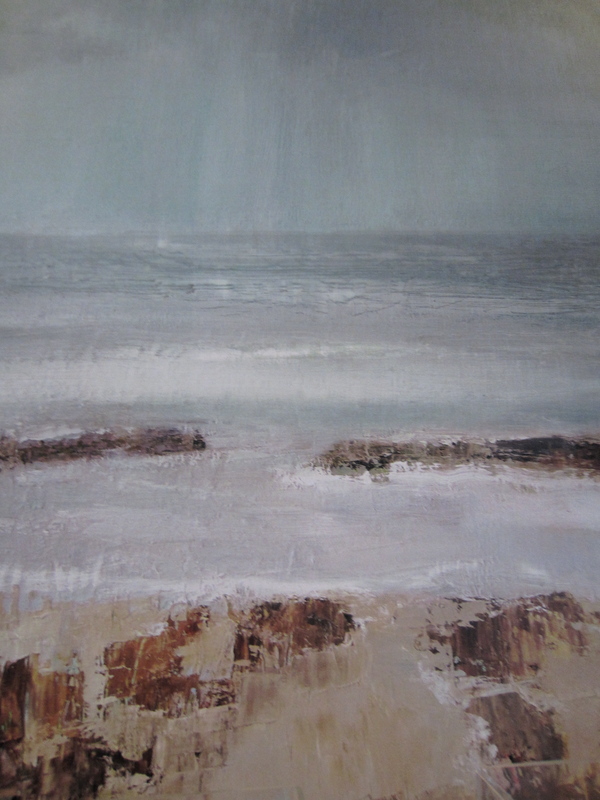 And when we do fall in love with something by a local artist, we try and support them. We bought a glass globe by Aron Leeman. 3. We did some painting during bath time this week. It was simple and fun. We put shaving cream in a muffin tin and used food coloring to color it. Cole loved painting the wall and himself. During Art Week We . . . The form of transportation we used the most this week, the car. We road-tripped up to Vermont and reorganized our van a bit. 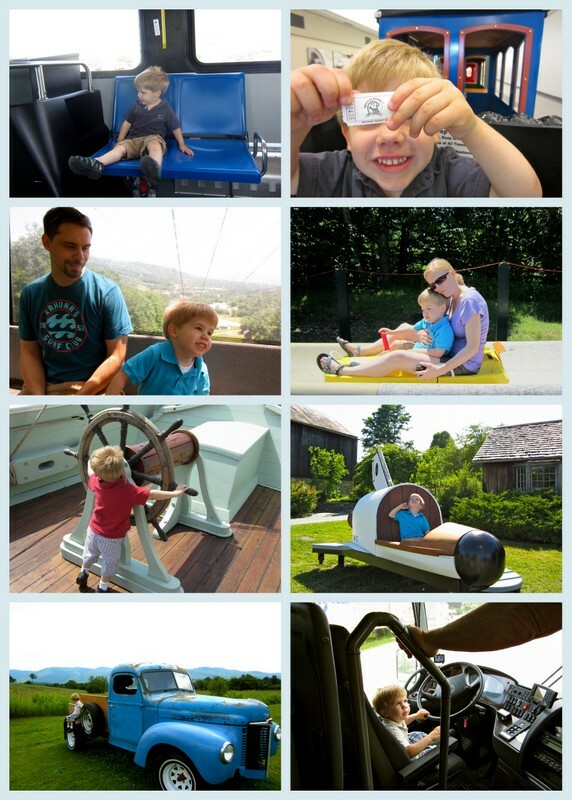 We blogged about taking a road trip last year, and we will have a whole week of this in August, so we did not write about it this week. 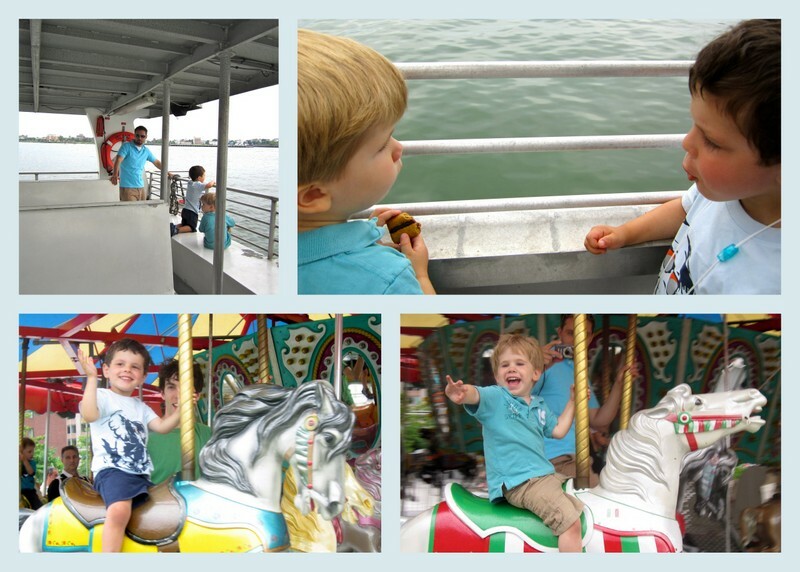 We went on a ferry boat this week with Cousin Oliver and his incredible parents. It was another great form of transportation. 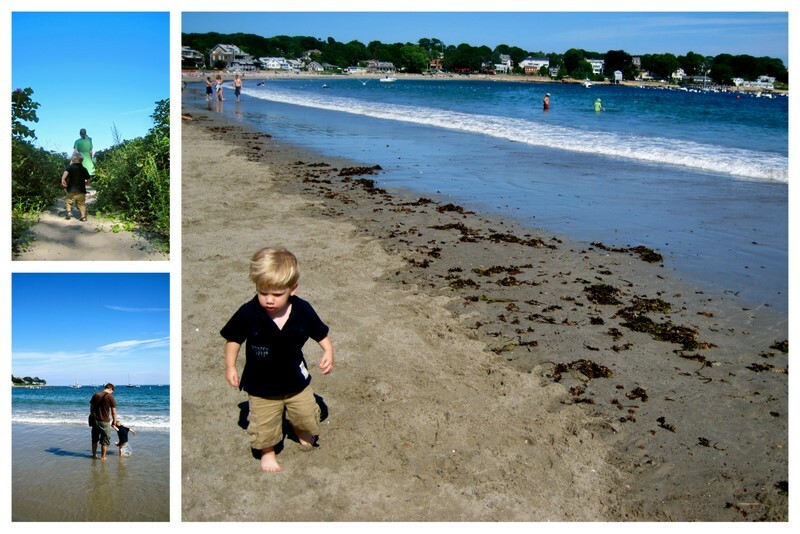 We love the Boston Harbor Islands as you can see in this post and this post. We also went on a carosel with cousin Oliver. A form of transportation that brings you back to where you started. I wish we had planned packing better and started earlier. We do have a packing list that we have gotten out of the habit of using. And typically I start putting aside clothes and such in the guest room leading up to packing so that we are not up the night before trying to remember what to bring . . . but before our trip to Vermont this week we had a party and then Andrew went out of town on business, so I did not get to it until the night before and day of. We forgot Cole’s bike and could not find the camera charger. Intentional planning for me = less stress. 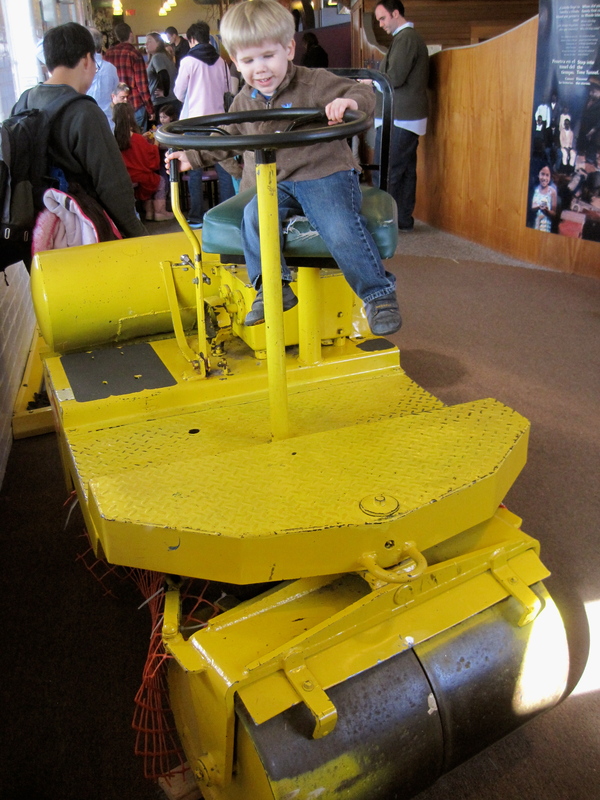 I had hoped to take Cole on the T (Boston’s subway) or the commuter rail this week, but did not fit it in, some day . . . 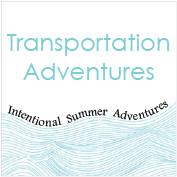 I began transportation week with a few ideas of things we wanted to do (my goal for the summer is 3 posts per week), but other opportunities presented themselves, and I love that because we were intentionally having transportation week we noticed opportunities we may not have. I am so grateful for our time talking with Joe the bus driver. I really appreciated hearing his story and the way he invested in Cole. I am so glad that we took a couple of nights away. I believe getting out of our daily routine brings more appreciation for it and a realignment with what is most important. During Transportation Week We . . . The truth is we adventure a lot and these days we drive a lot. 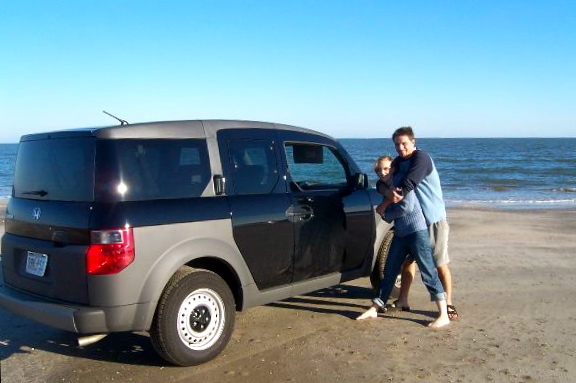 Andrew and I did drive one car for five out of our almost nine years of marriage. I loved it, and it worked for us. But add a little guy into the equation and two commutes (even though mine is under four miles) and we have two cars and drive everywhere. A couple of years ago we took the “No Impact Challenge” for a month, and worked to drive less, but taking a bus to the places we needed to get to was not an option . . . and for us adventuring out is also what brings us great joy. The long-lasting impact of the challenge, for us, was more about recycling than transportation. I did some reflecting about our transportation when Susan came to stay with us. Her family did not have a car, so she was very interested in driving. And we did go to all kinds of activities and on various adventures, but I also started looking for bus stops and ways to get around. We are in suburbia, so it is limiting. 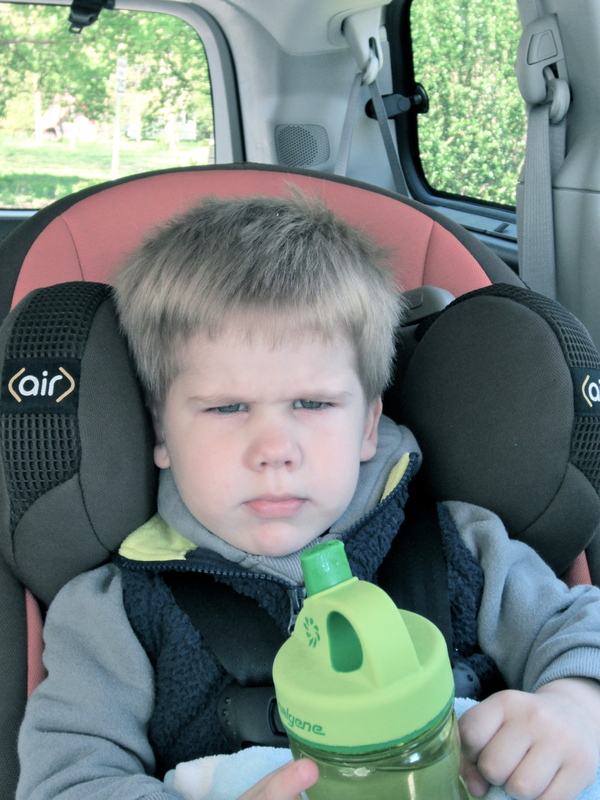 Colton has spent many hours restrained in a carseat, always a back seat view on the world (here he was modeling his “mad face”). 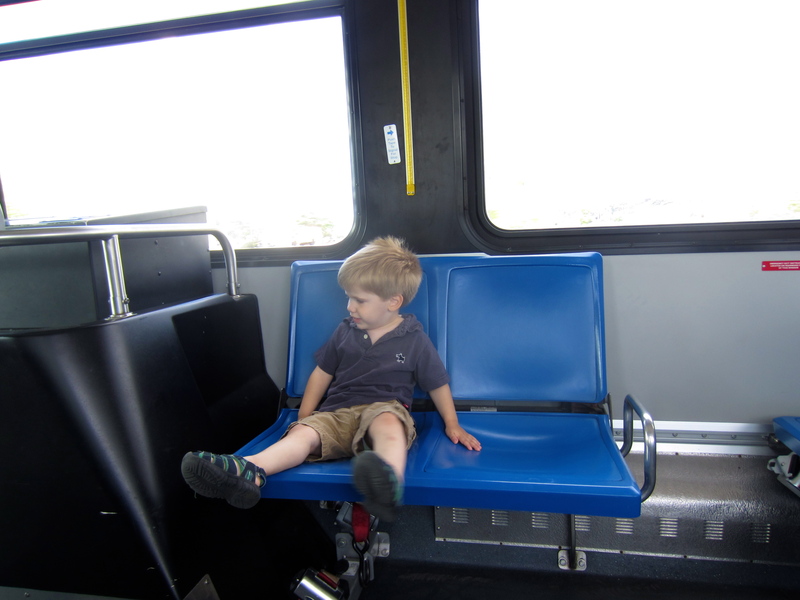 He finds other modes of transport intriguing and spends hours playing with busses, trucks, airplanes, and trains . . . so this week is all about Transportation Adventures. 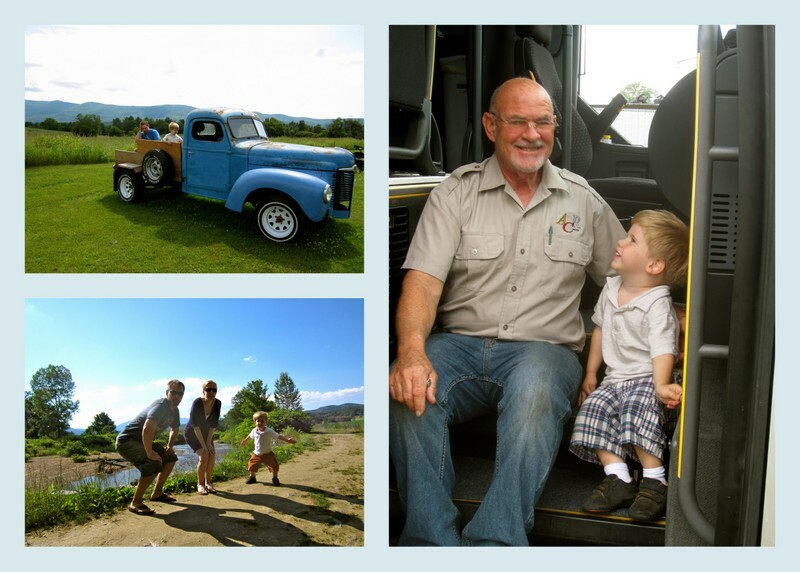 To Colton a bus has great mystique and holds much more adventure than a car. 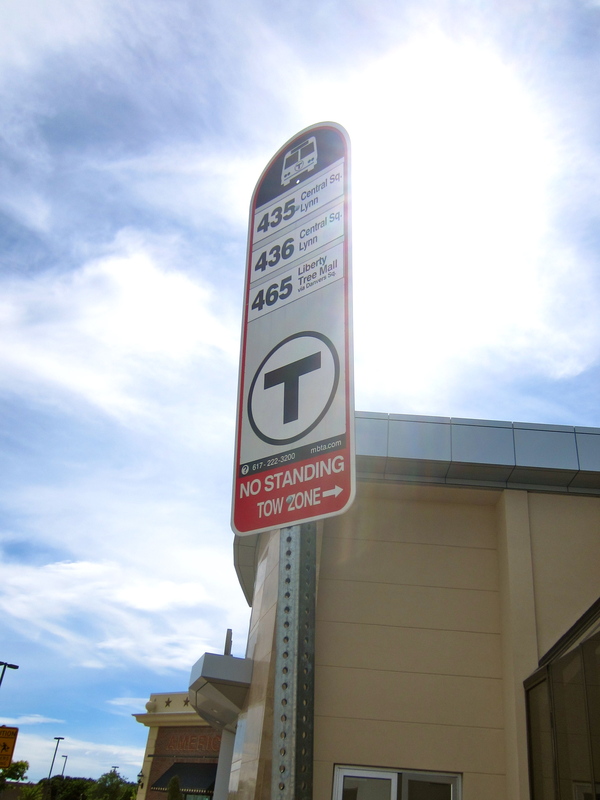 So we kicked off transportation week, a week talking about different ways to get around by hopping on the local bus. Ok, it was not that easy. First I pulled up a schedule, tried to decipher it and realized we needed to move quickly if we were going to make a morning bus and not spend the entire day waiting on busses. 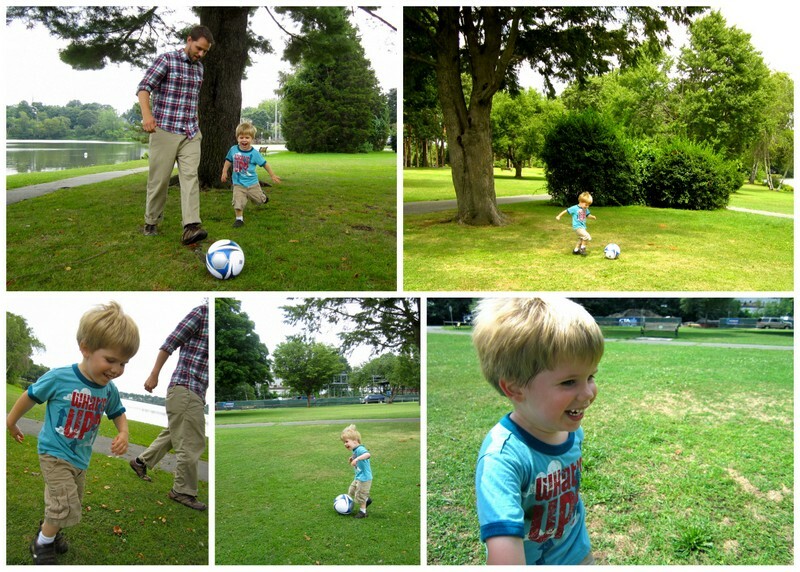 Hurrying a three year old . . . now that seems to be an oxymoron to me. This I do not understand. Colton loves to run everywhere, but when it is time to move, he always finds some stationary activity he would rather be doing. 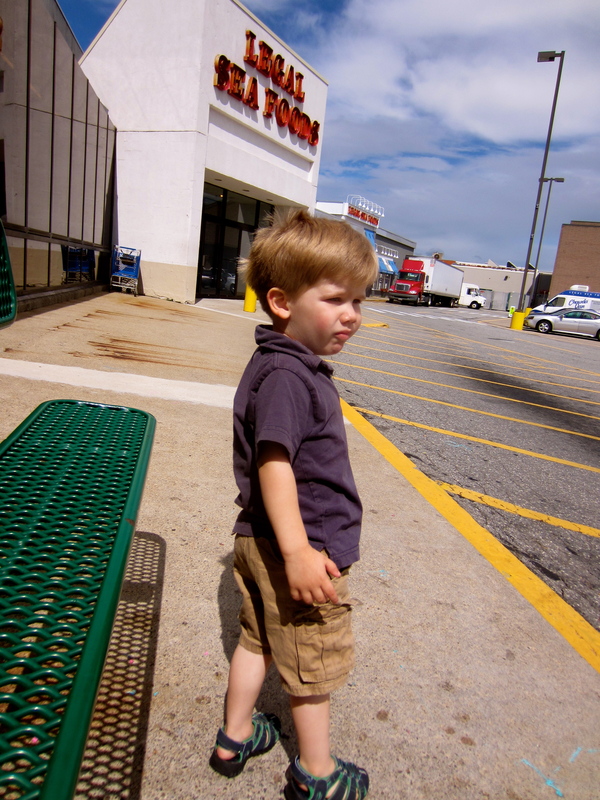 We got to the bus stop with a stroller three minutes before it was supposed to arrive – and I realized . . . I did not have any cash on me. I had no idea how much this was going to cost. I realized I was going to have to go find an ATM and get out cash (paying a fee) and then probably wait an hour for the next bus. So I explained to Cole what was happening and that if we missed the bus that was just fine, we would get another one (this was not ideal, we had no car, I had put that in the shop). It was what it was and we went off to find an ATM, we withdrew a $20 bill, accepted the fee and ran. When I got there, there was still no bus. 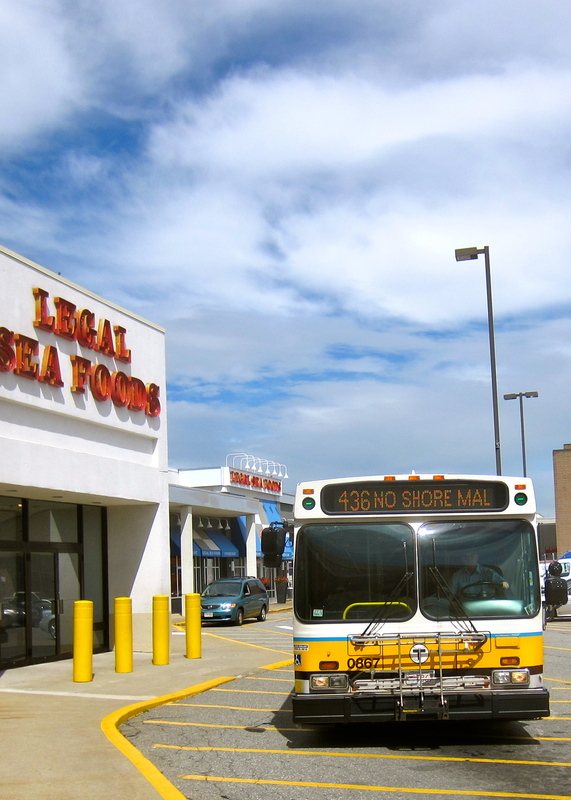 I asked a young smoker if she had seen the bus, she said no. We waited. 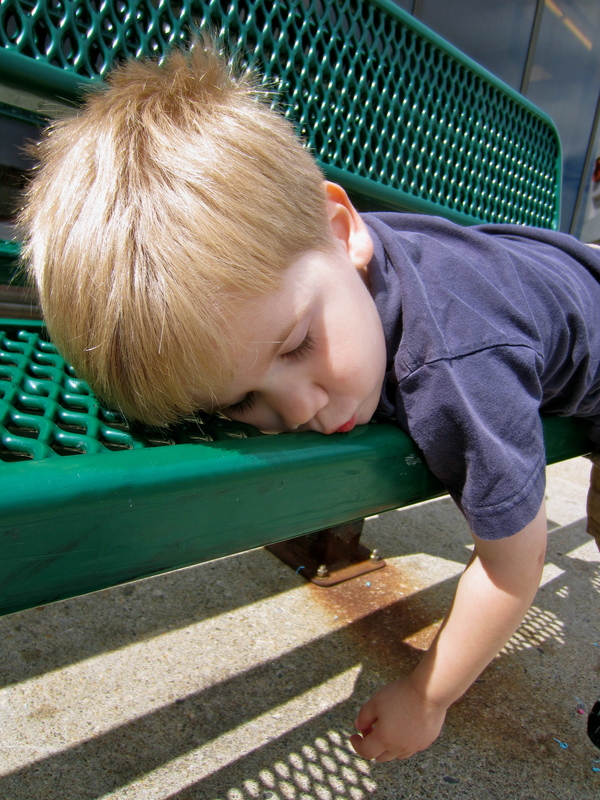 *New Phase Alert – Cole has taken to lying down in new places and pretending he is asleep (truth: I celebrate it, love when he is in one place). 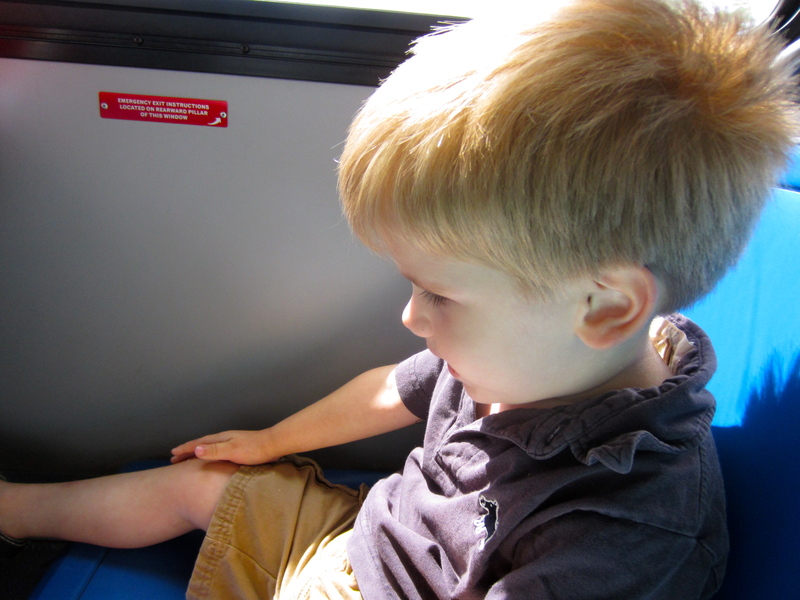 When the bus came, I got Cole out of the stroller, folded it up (though it broke a few months back, so does not stay folded). Twenty dollar bill and a stroller in one hand, a bag over my shoulder and my camera and Cole in the other hand I waited for all the people to disperse . . .
And there before me was the bus lady. She seemed mortified at my unorganized state. I told her I had a $20 and she began to moan and frustratingly explain that if I put that $20 in there I would get $18 of bus credit back, and did I want that? Did I actually ever ride the bus. I said no, apologized and was ready to call it a day. But she continued to berate me. 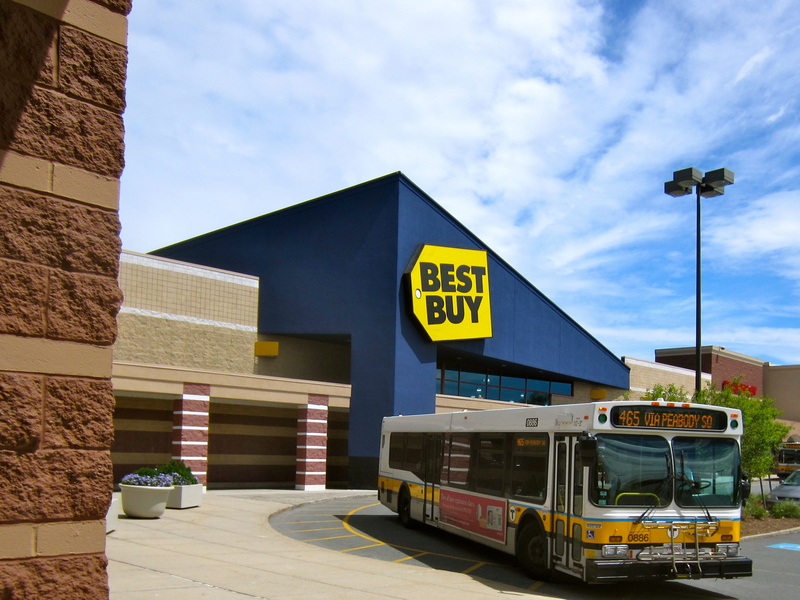 I apologized and as I tried to exit I asked, “The next bus is in an hour?” I stepped tentatively and carefully backwards with the stroller, my bag, my child and the $20 bill. She laughed out loud at me. “No it’ll be here in 15 minutes or so” and she slammed the door, except those doors don’t slam, they kind of whoosh. She whooshed the door and was gone. Back I went and I found a toy for Cole and we bought it (it was a little animal and when I found out it was $4.99 I resolved to bring it back). And then I searched for a way to ditch my stroller. We did not need it. I had taken it out of the car so I could race to the bus stop, but now it was just a burden . . . I found a place. Stroller in hiding, then I hid the toy and Cole returned his focus to the one thing he had been anticipating . . . the bus . . . This time it was a very nice man driving the bus, and I had less in my hands and had two dollars ready to give him . . . it is $1.50 and they require exact change . 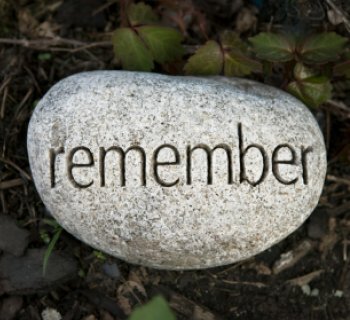 . . and I asked him what to do, and he shooed me away, taking $1.00, telling me I was getting the best deal of the day. Relieved, I thanked him graciously . . . But internally $1.00 seemed like a great deal of money to transport us less than a mile. But he was kind and I was relieved, and my child . . . It is hard to tell, but he was gleeful! Our return route was not as eventful. 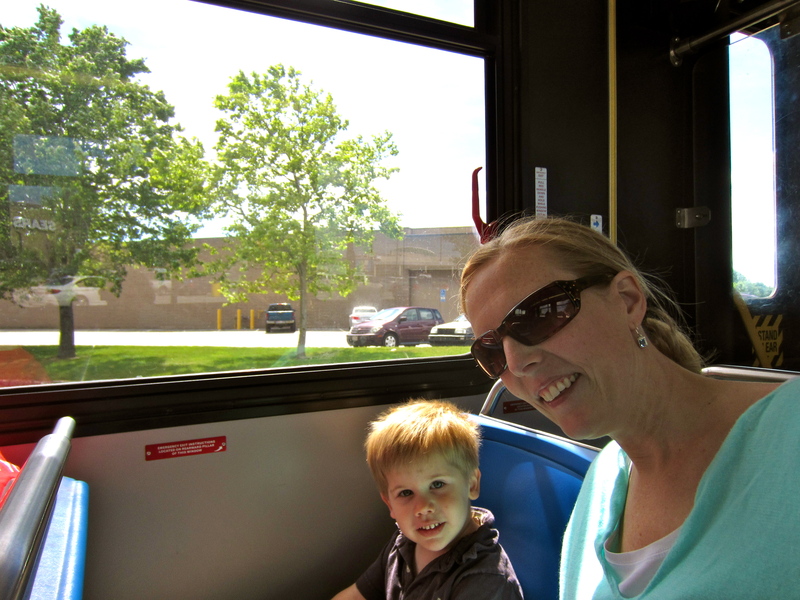 I had an exact $1.50 in my hand and Cole holding the other when we hopped aboard the return bus (ok, we hopped on the wrong bus at first, but we got on the right bus and it was tremendously easier). And did Cole learn any lessons? I am not sure. I asked him about it and he told me that it was fun and that a bus is bumpy and better than a car. And I am grateful for the lessons in adventuring for me and for the joy in the adventuring for him. The Sharpteam is inconsistent at best with blogging, but when we see a good intentional purpose for sharing our adventures . . . we are all in. 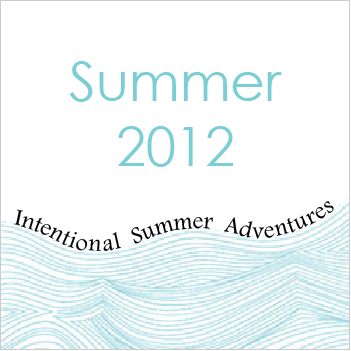 So a couple of weeks ago, we wrote about our commitment to ten intentional weeks of summer . . . I am writing today to let you know that we are kicking it off. 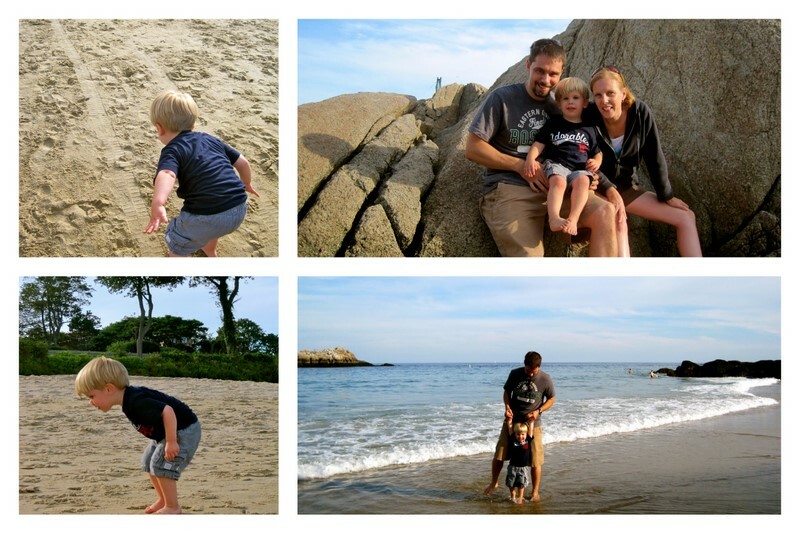 We jump into the ten weeks as summer officially begins (on June 21), and our first week of summer is our little guy, Cole’s birthday week (a June 22 baby). So stay tuned for ways we were intentional in celebrating his third birthday. 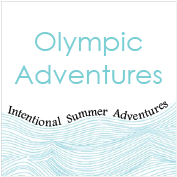 And then we will be on to more intentions and adventures to share with you. Here is how we are intentional. First: We come up with a number of different themes that Cole would enjoy during the summer and that we would enjoy as a family embracing. Next: Each weekend, we take time as a couple to think ahead to the following week and which week would fit best with our schedule. 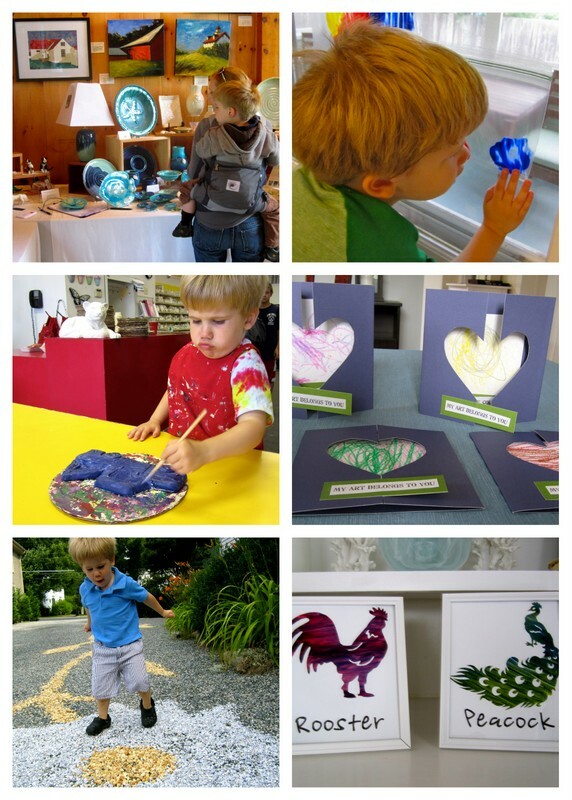 Then: We think of different activities, outings, foods, and books that might be enjoyable for Cole during the week. Then: We take the time in between regularly scheduled events to focus with Cole on our theme. 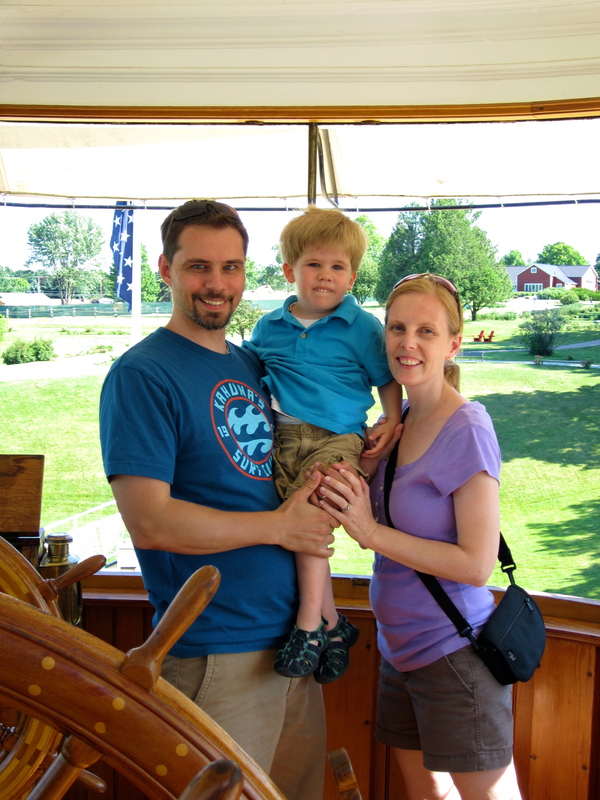 Finally: We are accountable to blog about it weekly. Our goal is three entries per week ( but we do like to surpass goals). 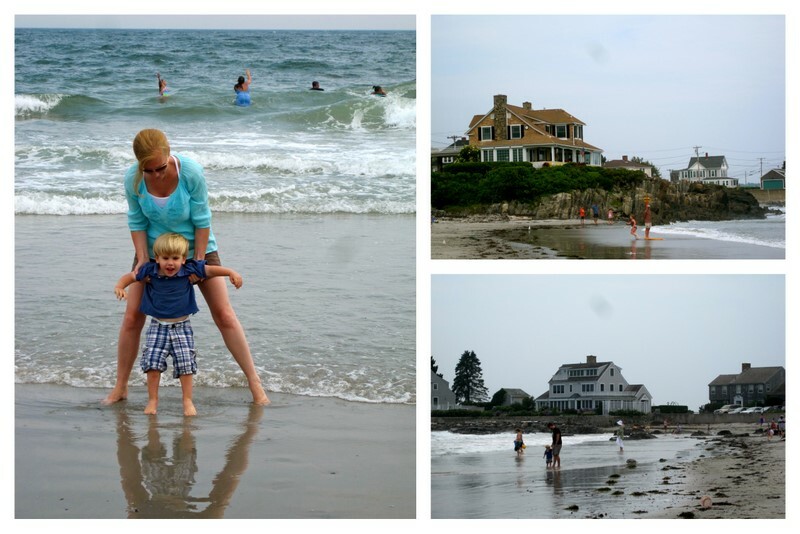 We love living by the ocean. 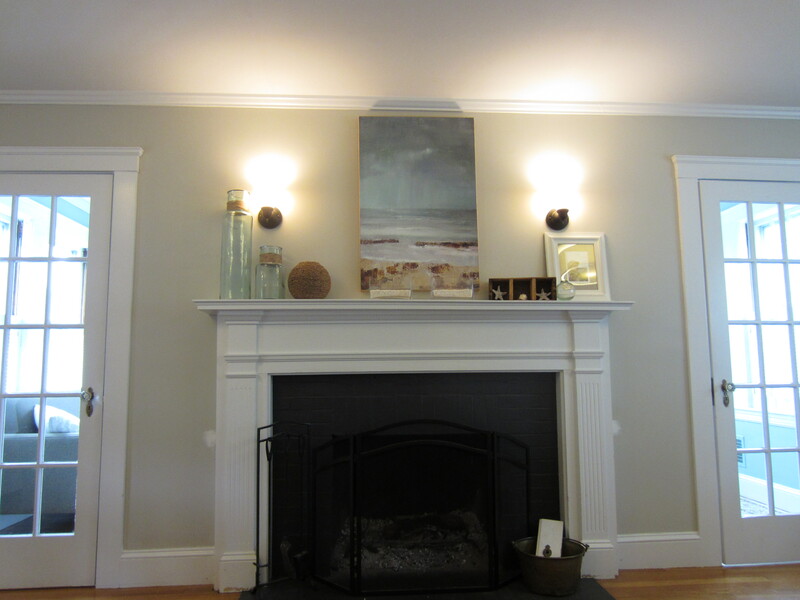 We have had this painting hanging in our bedroom and decided to use it as the inspiration for our summer mantel. 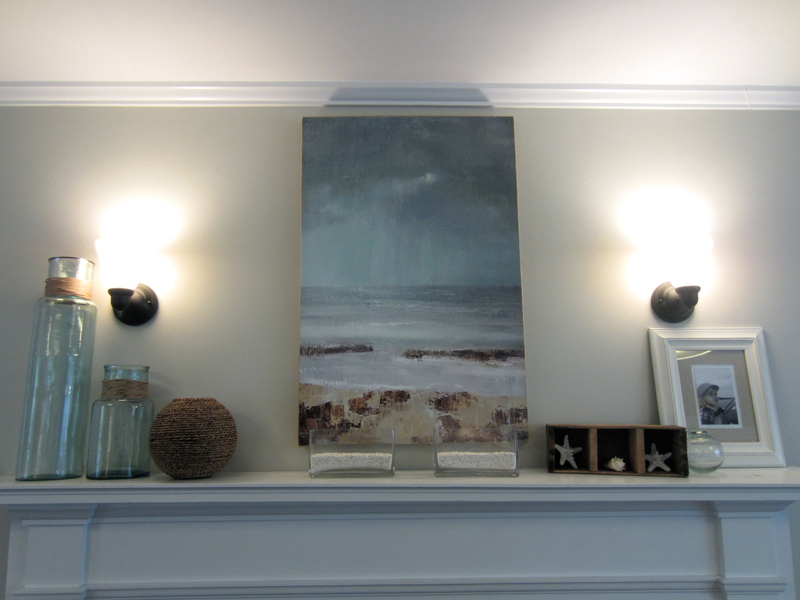 We wanted to take the colors of the sand, sea, and sky and bring them to our mantel. And we wanted to incorporate textures and varying heights. 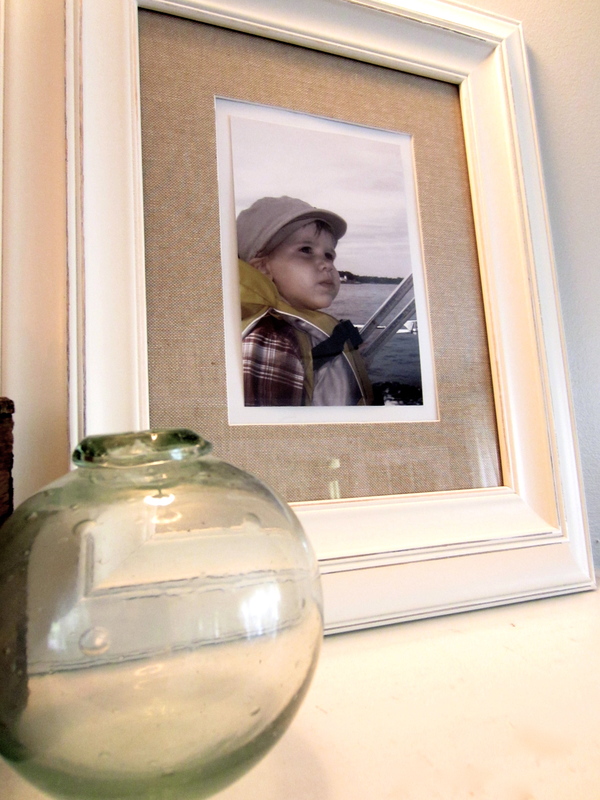 The picture in the frame is our little sailor, and I loved the canvas matting. 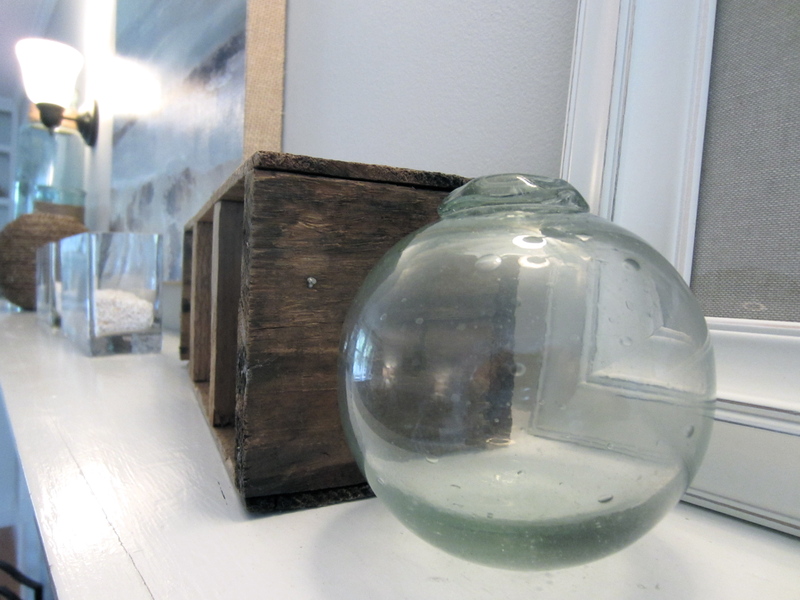 The glass buoy is from Pottery Barn. 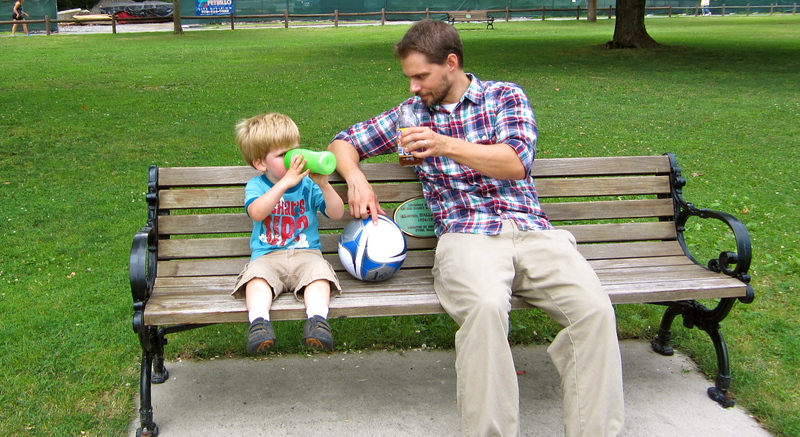 It is particularly meaningful to me that a buoy sits beside our little boy. Cole is an adopted little guy, we walked with his birth mother until all the doors shut. And when the doors shut, I went to the ocean, and it was there I heard the quiet whisper of assurance in my soul, as I watched the buoys. 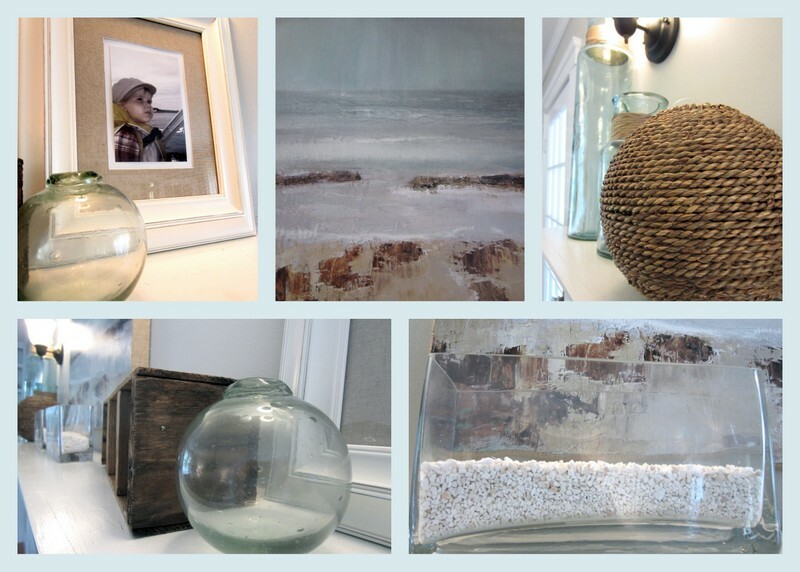 The textures we wanted to incorporate were rope, glass, wood, and sand. This mantel came together slowly, each piece going up, some coming back down. Now combined with the spruced up shelves in the living room, we are feeling and joyfully anticipating summer and all of our summer adventures. May your adventures be filled with sun, sand, and sky.